E-commerce has become the fastest-growing Internet activity in China after the number of online shoppers increased by almost 50 percent to 160 million last year, the China Internet Network Information Center (CNNIC) said on Wednesday. The number of China's netizens hit 457 million, continuing to be the largest globally, according to a bi-annual report released by the organization, which has been tracking the development of the Internet in China since 1997. The domestic research company Analysys International said that in terms of sales, the online-shopping market grew by more than 370 percent year-on-year, reaching 520 billion yuan ($78.79 billion) last year. "The electronic device and garment sectors are the key drivers of the boom, while many export-oriented companies have shifted their business to the online market after the 2008 economic downturn," said Chen Shousong, an analyst from Analysys International. The CNNIC report pointed to supporting policies and capital flowing into the online shopping industry as the main reasons for the rapid development. "The online market became an alternative for China's manufacturers, since their overseas orders had been slashed as a result of the financial crisis," said Chen. "Most of them chose to sell their products online instead of opening off-line shops, because an online shop doesn't require any domestic-sales channel." Group buying was another emerging sector of online shopping, the user numbers reaching 18.75 million last year, according to the report. After the US group-buying website Groupon.com started this business model, big Chinese online Internet companies such as Sina, Taobao and Renren all opened their own group-buying websites. The number of Internet users on mobile phones reached 303 million by the end of last year, almost two-thirds of all users. "Mobile Internet has huge development potential next year," the CNNIC report said. Alibaba Group and its partners are going to invest between 20 and 30 billion yuan in the project over the next three to five years, and it hopes to spark a total investment of more than 100 billion yuan in logistics development in China over the medium term, the group said on Wednesday. "Hopefully, within 10 years' time, anyone placing an order online from anywhere in China will receive their goods within eight hours, allowing for the virtual urbanization of every village in China," said Jack Ma, chairman and chief executive officer of Alibaba Group. Warehouses occupying 3 million square meters, enough to hold 560 American football fields, are supposed to be established. The Beijing/Tianjin area, the Yangtze River Delta and the Pearl River Delta were the regions Alibaba initially selected for the warehouse construction. Ma hoped more partners, such as venture capital and private equity companies, would join the effort. 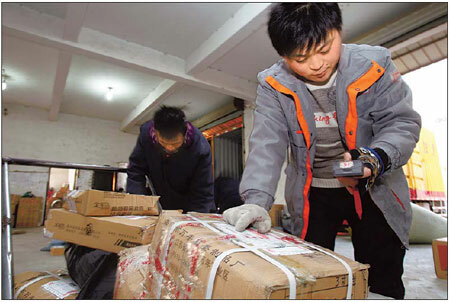 Alibaba's move comes as complaints about the logistic services in China have increased in the recent years. "E-commerce in China is going too fast and exceeds its logistic capacity," said Zeng Ming, chief strategy officer of Alibaba Group.